We believe that social and emotional skill development is the cornerstone to success in the school experience. Teaching occurs in large group, small group, and one-on-one situations accommodating a broad range of individual differences. We use the Responsive Classroom approach to help children build social, emotional, and academic readiness skills in a strong school community where they feel safe, challenged, and joyful. Children are guided to grow in independence, kindness, patience, cooperation, self-control, and responsibility as they interact with others and their environment. 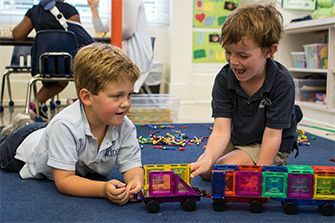 The joyful experiences of children’s play are fundamental to the Trinity Preschool experience. We provide opportunities for a balance of structured and unstructured, child-directed and teacher-directed, and indoor and outdoor play. Play is viewed as crucial to the children’s development of self, of social relationships, self-control, persistence, and pleasure in the school experience. Play is the foundation of all learning in the Preschool. Recognizing the importance of creating a bridge between the home and school environments for the Preschool child, we establish relationships with parents based on mutual trust, respect, and understanding. Parents are viewed as active participants in their child’s educational journey and the school/family relationship is only strengthened by the many opportunities for parent engagement in both Preschool and school-wide events and initiatives. We hope to see you at the Pink House soon!